Angel India's CO2 LASER Marking machine enables optimal marking condition for a variety of material, from soft materials like paper and various fabrics to hard materials like MDF and Acrylic, our CO2 marker can be used to mark, engrave or cut these materials at very high speed. With a wavelength of 10.6um, high precision marking is easily achieved. The Galvo-Steered Beam designed for marking enables the machine to mark at speeds as high as 20,000 mm/sec. Our CO2 LASER marking machine can be used to mark 2d barcodes, 2d data matrix, logos, graphics, or any other sequence of characters and numbers on your parts and products. Marking data can be input manually, bar code scanned, or downloaded from your computer or network system. 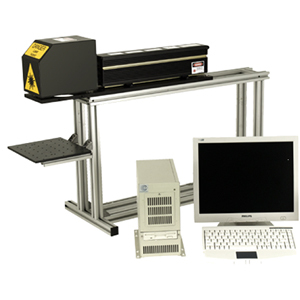 This laser system is widely accepted for product identification, serial marking, date stamping etc. This Machine is also capable of Jeans Whiskering, Scrapping, Damaging and Writing. Industry: Widely used in Jeans, food and beverage packaging, medicine, personal care products, tobacco, alcohol, dairy products, clothing accessories, leather, electronic component, chemical building materials products and other industries. Material: Denim, Wood products, paper, leather, cloth, organic glass, epoxy resin, fabric, plastic, rubber, ceramic, crystal, jade, glass and the vast majority of non-metallic materials such as man-made stone. As manufacturer we are always ready with spare parts and other requirements for the smooth functioning of machine. Our team can also integrate the machine in your production line even if you are using robots! In case of any problem we try our level best to resolve the issue within 24 hours. Best price with quality guaranteed. Application Electronic Component, Craftwork Gift, Leather, Shell Nameplate, Rubber Products, Garments Accessories, Fabric Cutting, Foodstuff, Medicine Package Printing & Plate Making, Wood products, paper, leather, cloth, organic glass, epoxy resin, fabric, plastic, rubber, ceramic, crystal, jade, glass and the vast majority of non-metallic materials such as man-made stone.